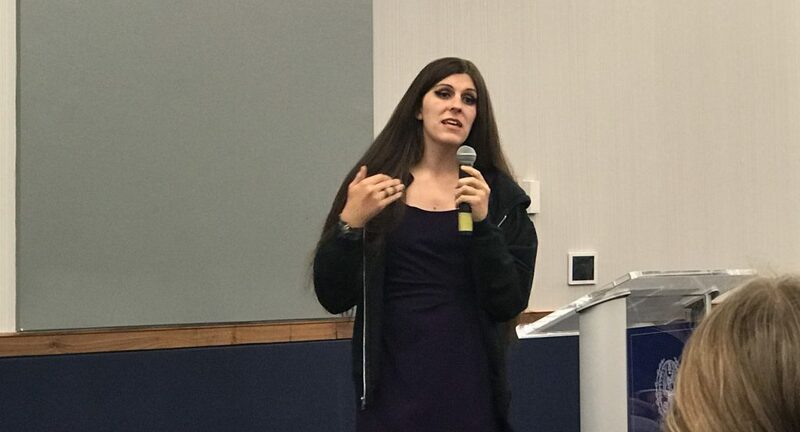 GU Pride and GU College Democrats co-hosted an event with Virginia House of Delegates member Danica Roem, in which she urged students to get involved in the political process. Roem is the first openly transgender person to serve in any U.S. state legislature. Roem had one message: find politicians who shares your values. She asked the audience for examples of politicians they liked, which varied from famous senators to local state representatives. Roem, a Democrat, won her seat in Virginia’s 13th House of Delegates District, which consists of Manassas Park and part of Prince William County, running on a platform centered around transportation and the economy. Her opponent was 26-year incumbent Bob Marshall, Virginia’s self-proclaimed “chief homophobe,” who was well-known for his failed bathroom bill proposal that would have barred transgender people from using the public restrooms that corresponded to their gender identity. Reflecting on her journey, Roem said that running for office was not always part of her plan, and was not something many thought she could do successfully. “I launched my campaign last year uninsured, unemployed, and driving a ‘92 Dodge Shadow America,” Roem said. Roem also spoke fondly of her career in journalism, noting that she was a reporter for a decade before deciding to run for public office. “I love reporting the news,” Roem said. “I love being the person who holds politicians’ feet to the fire.” She credited this background as a reporter with helping inform her on a wide variety of different policy issues. On the recent federal rollbacks of transgender rights, and the current administration considering defining gender as biological and immutable, Roem expressed a determined optimism for the future. “It was nice to hear from someone with a bright outlook on politics for a change,” said MacKenzie Grimm (COL ’21), a student worker at the LGBTQ Resource Center and GUSA’s LGBTQ+ Inclusive Policy Chair. The Oct. 30 event was sponsored by the LGBTQ Resource Center, the McCourt LGBTQ+ Policy Initiative, and the Georgetown University Lecture Fund. Jenny Xu (COL ’21), who organized the event and serves as the Co-President of GU Pride and Vice Chair of GU College Democrats, shared similar sentiments.